It is still hard to believe that JSL is one already. Last year at this time I was threatening to leave the hospital after a really horrible night. Now I am home with all three of my boys and my baby is getting so big. 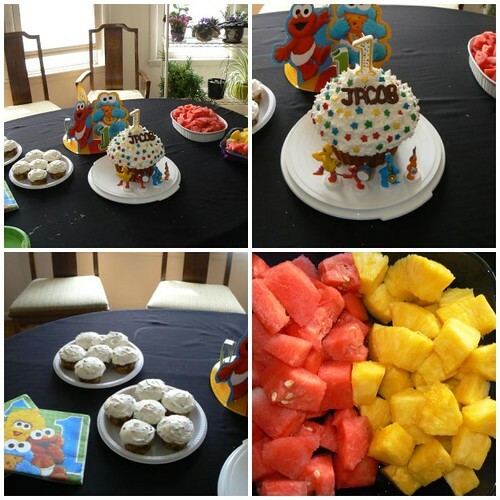 Last Sunday (yes on Mother’s Day) we had JSL’s first birthday party at my parent’s house. Saturday night JL and I baked the giant cupcake and twelve other cupcakes with the left over batter. We were up until almost 1:00 in the morning waiting for them to go into the freezer. In the morning we packed up the boys and went to my parents house. I quickly got everything out and started to frost the little cupcakes and decorate the big one. Thanks to my handy dandy decorating tool it came out really great and did not take too long in the scheme of things. Once the cake was done it was time to work with my mother and Aunt M (my sister-in-law) to get the food baked and ready to go. 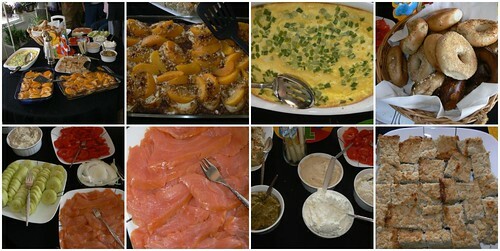 We served an egg bake with scallions, baked peach french toast, bagels, lox, cream cheese, vegetarian liver (Mimi’s specialty), hummus, cucumbers, tomatoes, onions, and potato kuggel (Mimi’s again). I could not have had such amazing things if my mother and grandmother (Mimi) had not helped with the menu and Aunt M had not helped with everything on Sunday – thank you all! While the preparations were being done in the kitchen the kids were busy playing. NHL, JSL and Cousin S were enjoying time with my brother, Papa and JL. 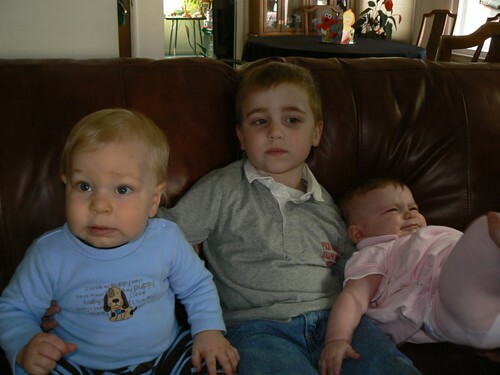 An attempt was also made to get a photo of the three grandkids together. This did not work out too well. Apparently this was the best that was captured. Everyone started to arrive at 11:00. While the food finished baking people talked and watched the kids play. JSL had an interesting time with my parent’s massager. All I can say is – he is a total BOY! All of the kids ate in the kitchen. It was too funny watching them interact with each other. After brunch the kids went to play and we put the left over food away. Then it was time to set up all of the good stuff on the table for round two of food. It was finally time to put the giant cupcake on the table! Everyone came to the dining room so we could light the candle, sing Happy Birthday to JSL and have him attempt to blow out the candle. He was quite serious at one point with everyone standing around watching him. While I was busy cutting pieces of giant cupcake for everyone JSL was in the kitchen digging in. JL said that he was quite careful at first. After a little while he figured out that he could get more into his hands and stuff that into his mouth faster. 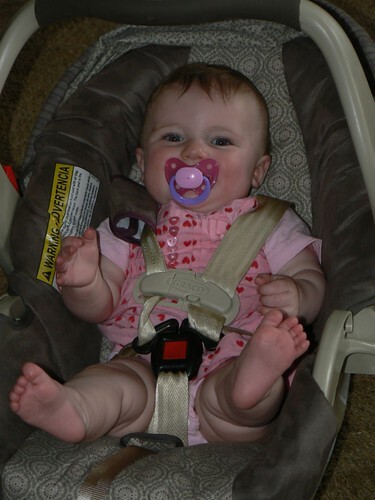 Be glad that you did not have to clean up the little guy and/or his booster seat. 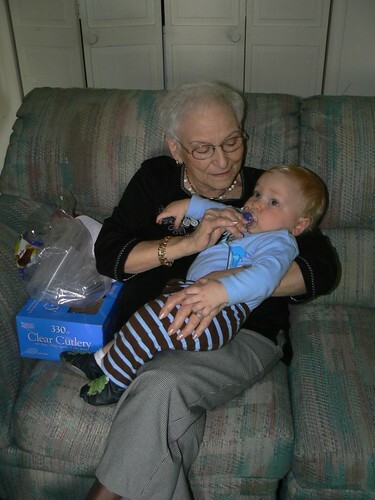 NHL was amused with his brother’s mess and declared that JSL looked like Grandpa thanks to his white frosting beard. Once JSL was cleaned up (read – the best that could be done without a tub) it was time to open presents. This was something pretty new for him. Sure he had a few items at Chanukah time, but he was so little in December. NHL was quite eager to help his little brother dig into the gifts. JSL did not understand why he could not play with his first gift and started to have a mini temper tantrum when we tried to hand him a new package. He did not want that and wanted to play with his new toy. 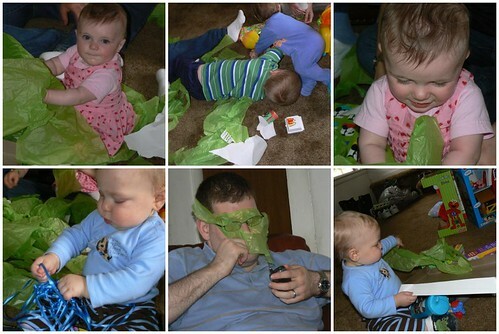 Of course the real fun came soon after this when all five of the kids started to romp in the wrapping paper. Oh wait, some adults also got into the mix. Check it out. . . Being the birthday boy was hard work. 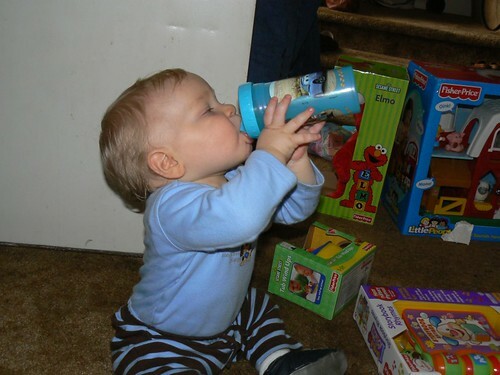 The little guy had to stop at one point to chug some water from his sippy cup since he was so thirsty. It was a very nice day. Seeing all of our family members, eating good food was nice but soon it was time for everyone to leave. Uncle I and Aunt M had a big trip ahead of them. Cousin S was all ready to go after hugging everyone goodbye. Before we knew it everyone was gone. It was time to clean up, pack up and go home. 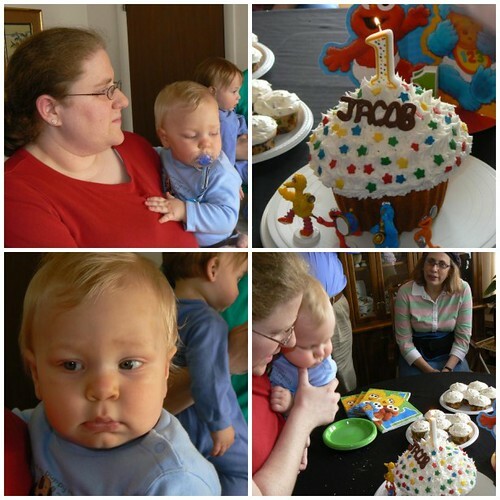 JSL did not nap all day and quickly had a bath, ate an early dinner and went to sleep dreaming of giant cupcakes. Now we can sit back for a few weeks until we start to plan NHL’s 5th birthday party for August. He has ideas, but we shall see what we agree to. Taylor got the little people barn as well. He loves playing with all of the people, and putting them into the silo. 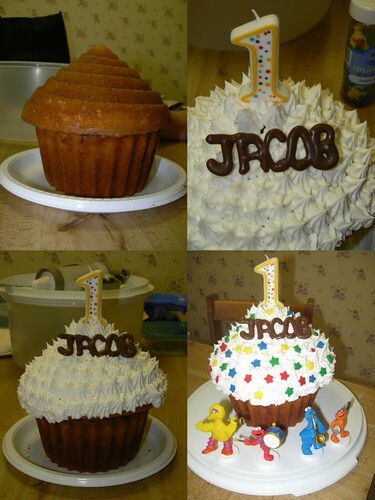 Happy first birthday, Jacob! All of those pictures are terrific! Do you mind if I add you as a Flickr contact? My screen name is BathtubJunkie. That gigantic cupcake is just awesome. What a terrific idea! Oh, and I love the last photo!!! You know, a thought just occurred to me. That first picture (of the undecorated cupcake) almost looks like a beehive! You could frost the cupcake with yellow icing and then attach cute little bees to it! Almost like the cover of Martha Stewart Living magazine this month. Wow! You had a wonderful celebration for JSL! I love all the pictures and a few of those look really similar to some I just took. HA! He’s such a cute boy. Happy Birthday again to the little guy! Oh my, what a great looking birthday. Love the spread and the big cupcake! Happy First JSL! happy birthday to the little guy! we used the sesame street first birthday stuff too! i love the giant cupcake!!! What a great birthday party! Love that huge cupcake cake. I wouldn’t even know where to begin eating it! LOL! 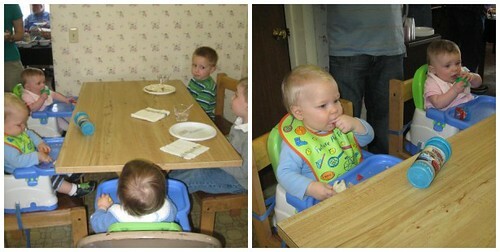 I love watching babies eat cake. They make such a mess but they’re so happy!